D-Link port forwarding, also known as virtual server, allows you to configure inbound Internet connections to your router to be routed to specific devices on the network. In order for surveillance system cameras to be accessible over the Internet, your router is configured to forward requests to your surveillance DVR or directly to IP cameras. The IP address that your router assigns to your DVR or to IP security cameras is a LAN (internal IP address) that cannot be accessed from outside of your local network. These instructions are for more recent D-Link routers such as the following: DIR-615, DIR-825, DIR-655, DIR-628. 1. Open your D-Link router's control panel by going to the IP address http://192.168.0.1/ in a web browser. You will be prompt for a password. If you did not setup a password on your router, the dlink default password is usually blank. Enter admin for the username and leave the password blank or enter your password. 1. Click on the "Advanced" tab (#1 below). The virtual server screen will open. 2. Click the check box next to the first open virtual server entry and fill in the Name for this service. This can be anything that you choose. Also fill in the IP address of the device that you are setting up port forwarding for. 3. Enter the port # for both the Private Port and Public Port. Ports 80, 4550, and 5550 are the ports that need to be forwarded for Some DVR webcamserver to work. You need to make an entry for each port. Most of our stand alone DVRs only use one port which should be supplied on the instructions for the particular DVR you are installing. 4. Select "TCP" for Protocol. 5. Select "Always" for Schedule, and "Allow All" for Inbound Filter. The port forwarding entry is now added. 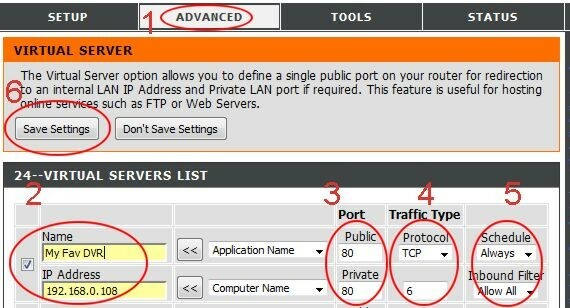 If you need to add additional port forwarding rules, repeat the above steps. If you are CCTV technicians you need to know the two main categories of processors are 32-bit and 64-bit. The type of processor a computer has not only affects it's overall performance, but it can also dictate what type of software it uses. The 32-bit processor was the primary processor used in all computers until the early 1990s. Intel Pentium processors and early AMD processors were 32-bit processors. The Operating System and software on a computer with a 32-bit processor is also 32-bit based, in that they work with data units that are 32 bits wide. Windows 95, 98, and XP are all 32-bit operating systems that were common on computers with 32-bit processors. The 64-bit computer has been around 1961 when IBM created the IBM 7030 Stretch supercomputer. However, it was not put into use in home computers until the early 2000s. Microsoft released a 64-bit version of Windows XP to be used on computers with a 64-bit processor. 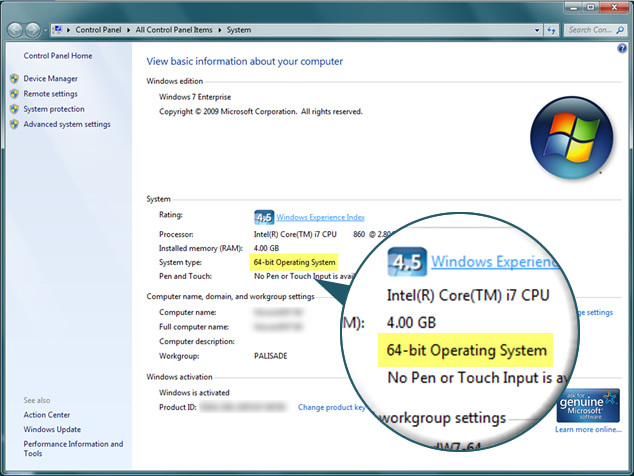 Windows Vista, Windows 7, and Windows 8 also come in 64-bit versions. Other software has been developed that is designed to run on a 64-bit computer, which are 64-bit based as well, in that they work with data units that are 64 bits wide. The main difference between 32-bit processors and 64-bit processors is the speed they operate. 64-bit processors can come in dual core, quad core, and six core versions for home computing (with eight core versions coming soon). Multiple cores allow for increase processing power and faster computer operation. Software programs that require many calculations to function operate faster on the multi-core 64-bit processors, for the most part. 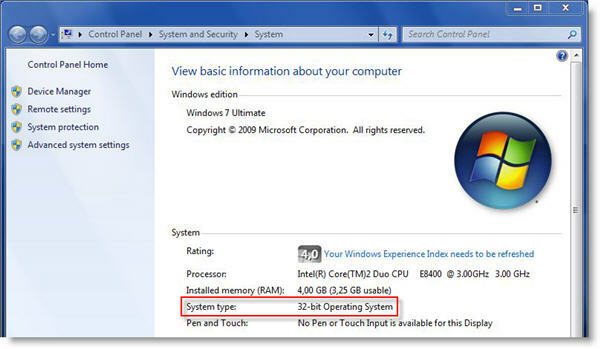 It is important to note that 64-bit computers can still use 32-bit based software programs, even when the Windows operating system is a 64-bit version. Another big difference between 32-bit processors and 64-bit processors is the maximum amount of memory (RAM) that is supported. 32-bit computers support a maximum of 3-4GB of memory, whereas a 64-bit computer can support memory amounts over 4 GB. This is important for software programs that are used for graphical design, engineering design or video editing, where many calculations are performed to render images, drawings, and video footage. One thing to note is that 3D graphic programs and games do not benefit much, if at all, from switching to a 64-bit computer, unless the program is a 64-bit program. A 32-bit processor is adequate for any program written for a 32-bit processor. In the case of computer games, you'll get a lot more performance by upgrading the video card instead of getting a 64-bit processor. In the end, 64-bit processors are becoming more and more commonplace in home computers. Most manufacturers build computers with 64-bit processors due to cheaper prices and because more users are now using 64-bit operating systems and programs. Computer parts retailers are offering fewer and fewer 32-bit processors and soon may not offer any at all. When to use: When you need to limit file size and the quality of video is less important. When to use: When consistent image quality is critical and predicting or limiting file size is less important. (In the computing world you would actually use 1024K = 1Mb and 2048K = 2Mb, but since most CCTV devices won’t allow those exact numbers, we just round them down to the closest thousand.) These figures are important to familiarize yourself with to manage your network load. 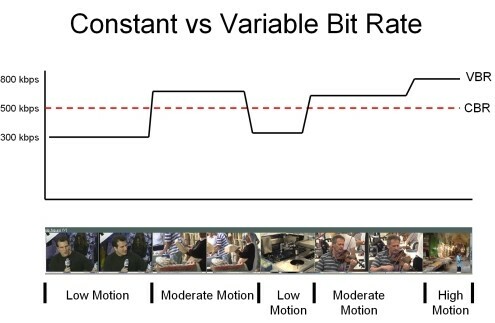 For example – 1 camera running a high bitrate of 8000Kbps (8Mbps) is no problem on a 10/100 network. 10 cameras at that bit rate = 80Mbps. 80Mbps is 80% network utilization on a 10/100 LAN. This is enough to see visible slowdown on the network and may begin to cause problems. Switch to a Gigabit LAN and that becomes 8% utilization. Always check the capabilities of the network you are installing on – this can save you from a lot of headaches. When using IP cameras, always use Gigabit routers and switches when possible. Also, make sure your NVR is connected to a gigabit switch. Plugging your NVR in to a 10/100 switch will limit your NVR to a 100Mb connection.